Are you ready to start your wedding registry? It’s one of the best parts of getting married. Whether you’re moving into a new home with your significant other or just need to refresh your kitchen, we’ve got you covered with great wedding registry ideas. Here are all the essential kitchen products you should have on your wedding gift list. 1. Register for whatever you want. Don’t worry about over-registering. It’s better to request more gifts than not enough, so get the essentials for your kitchen. Whether you’re a newbie in the kitchen or on the cusp of becoming a top chef, you need cookware. 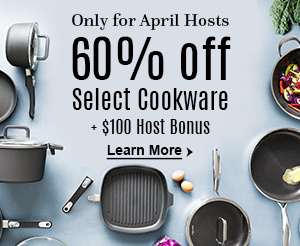 You’ll need a nonstick cookware set and a stainless steel skillet. Stoneware is also a must. 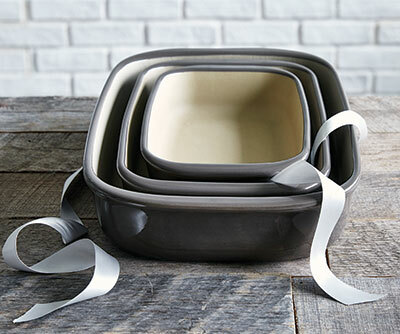 A regular baker set or covered baker helps you get an entire meal on the table quickly and in style. 2. Do it together. The two of you should be able to enjoy everything on your wedding registry. Think about what type of cooking you do together like grilling and entertaining. A portable grill is perfect for newlyweds because you can bring it camping, tailgating, or picnicking. If you get a grill, don’t forget about grilling tools. Throw a party and invite a few friends over for barbeque and appetizers. A stoneware entertaining set or self-cooling dish is great for serving appetizers or sides. And don’t forget, you’ll need bar tools like a wine opener and chiller. 3. Think about your lifestyle. Are you always on the go or trying to eat healthy? Consider that as you pick gifts for your bridal registry. If you’re a couple with hectic weeknights, you’ll want both a pressure cooker and a slow cooker. A pressure cooker is convenient for weeknights when you have some time after work to get a quick dinner made while the slow cooker is for days when the only time you have to make a meal is in the morning before heading out the door. Microwave-safe cookware is also great for busy nights because it shortens your cook time and provides a fresh meal. If you want to eat healthy, get a spiralizer to make veggie noodles and a salad spinner to wash and dry fresh produce in seconds. 4. Be considerate of your shower or wedding guests. Register for items in a range of prices so your guests have options within their budgets. Think about adding those random kitchen tools that you didn’t know you needed but will change your cooking style forever like a food processor. It will be your go-to tool to cut down prep time. Don’t forget to also add cookware utensils and sharp knives to your wedding registry checklist. 5. Don’t forget the sweets. For dessert lovers, you’ll need some baking essentials in your kitchen like a cookie sheet set, brownie pan, mixing bowl set, and cake pan. The best part is some of the bakeware can double as cookware. You can make toasted garlic bread under your broiler on a cookie sheet or appetizers in a brownie pan. Ready to get showered? Host, or have a loved one host, a Pampered Chef wedding shower for you. Stock your kitchen with the essentials to create a lifetime of memories. I’m a consultant but I don’t have a, I guess you would call it a page manager,can my clients still go on line for the registry and still send it to me for my credit on my clients party? If not then this sight doesn’t work for me. I’m loving this Bridal Registry. I’ve helped several brides in the past few months. Such a wonderful idea. Create a Registry and get FREE PRODUCTS! No other company does this. Thank you Pampered Chef! I purchased items at a Pampered Chef party for gifts from my nieces bridal registry. The consultant thought she could get the items removed from the registry so that they don’t get purchased twice. After checking she now tells me that she cannot get them removed. Her wedding isn’t until July and I would prefer that she not know who purchased them until she opens her gift. How do I get them off her registry or I will cancel this order from the party. Her registry is on The Knot. Rosanne – the consultant that you set the bride set up the registry with is able to manually remove those items – please contact her again and she can call our PC help line if she has questions.